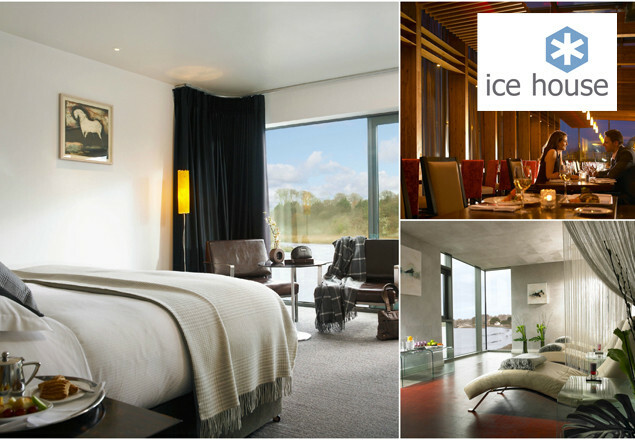 A one night stay at The Ice House for 2 with breakfast, evening meal, spa treats & late check out. Looking for the perfect gift for someone special this Christmas? Want to plan a break away or New Year’s Treat for yourself? With this exclusive offer from Rewarding Times and Ice House in Mayo, this fabulous one night stay in a gorgeous deluxe river-view room with king sized bed, goose down duvet and amazing panoramic views of the River Moy, a delicious 3 course dinner prepared by chef Anthony Holland, pre-dinner Prosecco and a spa credit for only €189. Check in to your stunning room with a luxurious supersize bed, & fully kitted out bathroom with VOYA amenities. Enjoy a glass of Prosecco each before a delicious 3 course dinner in the riverside restaurant. Awake to stunning views and The Irish Times waiting at your door! Also included in this wonderful offer is €25 credit each for Chill Spa, valid for any 60 minute (or longer) face or body treatment. With five luxury treatment rooms, thermal suite and an outdoor spa garden featuring hot tubs and a cedar barrel sauna, the Chill Spa is a haven of tranquility and relaxation. Winner of best boutique Spa and best therapist at the Tatler Spa Award 2014. Plus, enjoy 10% off at Foxford Woollen Mills, only a short drive from the Ice House. Nestled on the Wild Atlantic Way, with stunning views of the River Moy, the boutique Ice House offers the perfect combination of old school elegance and modern style. The impressive building is a wonderful fusion of old and new with transparent modern glass structures intertwined with original features from the 19th century ice house store. A glass of Prosecco each before dinner. 3 course dinner for two people. Full Irish breakfast for two. A €50 credit per booking for Chill spa, valid for any 60 minute (or longer) face or body treatment. 10% at Foxford Woolen Mills. Available from January 3rd to March 24th 2016. Vouchers valid Sunday to Friday inclusive. Certain dates excluded – February 12th to 20th & March 17th. Price is for 2 people sharing a deluxe river view room for one night. Extra night available Sunday to Friday for €99 per room B&B directly from hotel.